South-eastern England may lack the stunning prehistoric monuments of the south west, but that is not to say that there is nothing of interest here for today’s archaeological explorer. 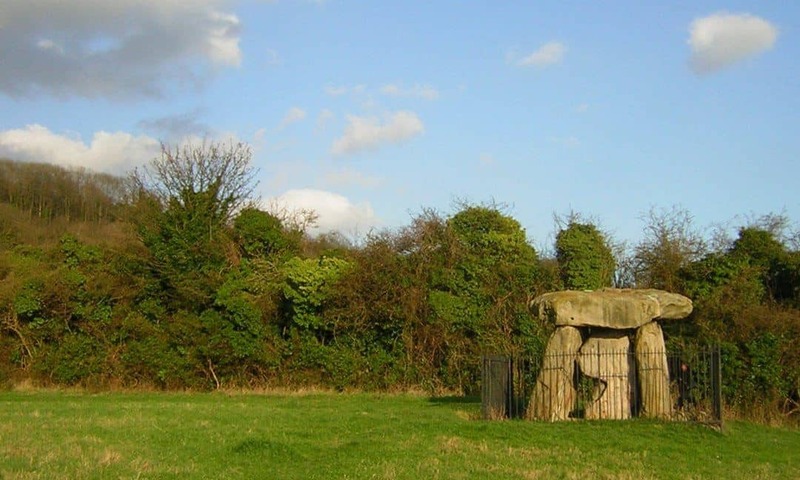 Perhaps the most prominent examples are the so-called Medway Megaliths, a series of at least six chambered long barrows located on either side of the River Medway in rural Kent. These reminders of our Neolithic past are positioned on the North Downs, a beautiful area where woodland continues to dominate the high ground but where most lowland areas have given way to crop-fields and hedgerows. Although these sites may not be as well-known as some of their Cotswold-Severn counterparts, they nevertheless provide a rewarding visit for all those with a love of prehistory and archaeology. The burial chamber of Coldrum Long Barrow. During the fourth millennium BCE, in what the archaeologists call the Early Neolithic (‘New Stone Age’), much of Southern England remained covered in dense woodland. Ancient Britons traversed this landscape via trackways through the forest, along which they herded the cattle that were central to their way of life. Living a semi-nomadic lifestyle, these Early Neolithic people left behind comparatively little settlement evidence for archaeologists to discover. However, what they have left for us is something far more impressive. In many parts of Britain, substantial stone-and-earth monuments were erected that archaeologists call ‘chambered long barrows’. 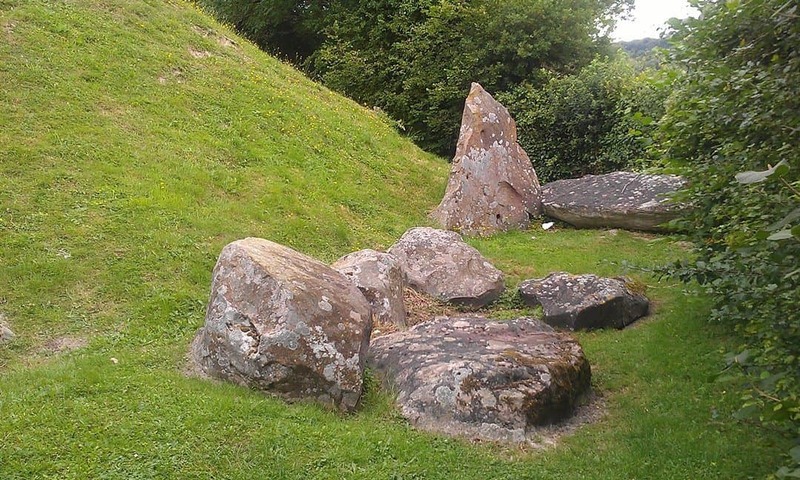 These consist of oblong, earthen tumuli (‘barrows’) that encase a chamber constructed out of large megalithic stones. Some clearly served as tombs, with human remains having been left in their chambers, but excavation has suggested that others never served this function. The modern visitor is therefore left to ponder an intriguing question: what were these monuments for? Far from being indigenous to Britain, this architectural tradition appears to have developed in (what is now) Spain and Western France. From there it gradually spread north – either by migration or cultural exchange – and thus established a presence across much of Western Europe. In Britain, the chambered long barrows are not evenly distributed throughout the landscape, but rather are clustered in certain regions. Perhaps the best known are the ‘Cotswolds-Severn group’ found in the south-west of the country and among which can be found such famous examples as the West Kennet Long Barrow and Wayland’s Smithy. 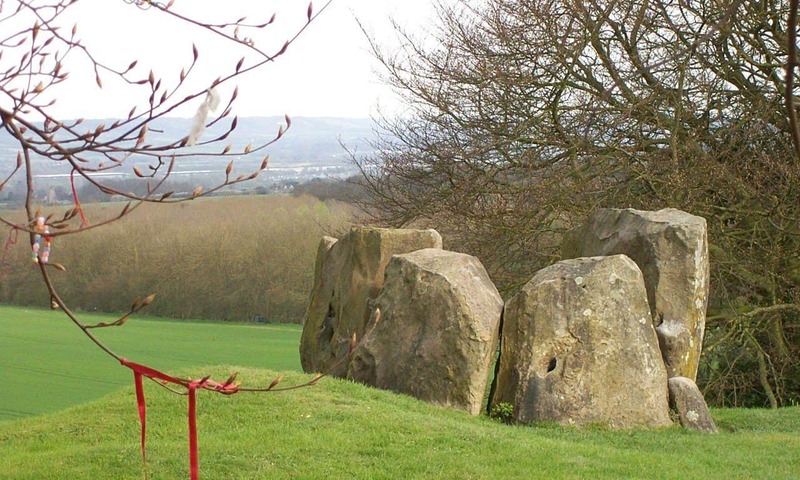 Perhaps the best known, and certainly the most accessible, of the Medway Megaliths is known as the Coldrum Stones. While the tumulus itself has lost much of its height and several megaliths have slipped from their original positions, this long barrow nevertheless gives a good impression of the original Neolithic layout of the Medway Megaliths. For this reason, it is the ideal candidate for anyone starting out on their exploration of these fascinating constructions. Rudimentary excavation took place in 1910 and again in the 1920s, revealing that the chamber once contained the remains of at least seventeen people, a mixture of adults and children. Analysis revealed that the bones had been de-fleshed prior to deposition, although there were no signs of cooking and thus cannibalism seems unlikely. Instead, these people probably underwent a process of excarnation, by which their bodies were left exposed to the elements for some time before any further flesh was scraped off and the bones collected and interred within the dark recesses of the chamber. Fascinating as this is, it still leaves us with many unanswered questions: who were these individuals and why were they buried here? Far from being little more than a dead relic of a bygone age, today the Coldrum Stones remains an important place for the local community. Many visitors choose to tie brightly coloured strings and ribbons to the overhanging trees, making a wish as they do so. 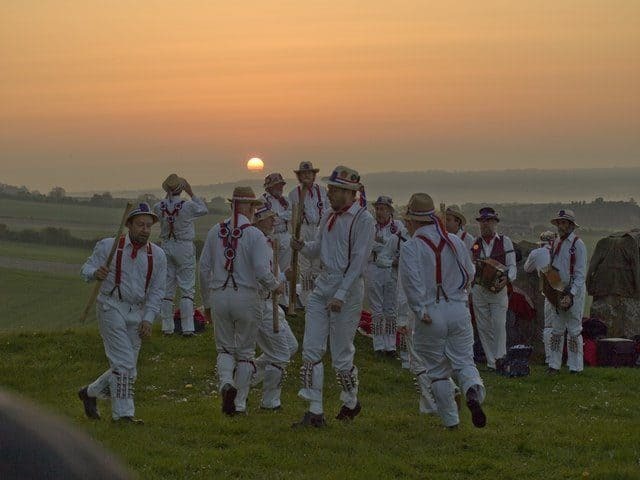 Others get up early to watch the sunrise over the Stones on May Day, where they are rewarded with an annual performance from a troupe of Kentish Morris dancers. The long barrow is also a sacred site for members of Kent’s modern Pagan community and hosts semi-regular ceremonies by a local Druid group. Access is enabled by a small car park located just off Pinesfield Lane in the village of Trottiscliffe (pronounced ‘Trowsley’). Once there, a muddy track known as Coldrum Lane can be followed for about 650 meters to reach the site. Sturdy footwear is recommended. The site is signposted, although beware of one plaque, added in the 1920s, which (quite incorrectly) claims that the chambered long barrow is in fact a stone circle! Not far from the Coldrum Stones, on the western side of the River Medway, lie two further Medway Megaliths. These, the Addington Long Barrow and Chestnuts Long Barrow, are located only about 100 metres apart, on land owned by the resident of Rose Albe, an adjacent house built in the 1950s. Excavation has revealed not only older Mesolithic activity on the site, but also a subsequent Romano-British, Medieval, and post-Medieval presence too. It is likely that at some point between the eleventh and thirteenth centuries a group began digging into the barrows in the belief that they contained buried treasure, while in later centuries they became a popular local picnic spot, as evidence by clay pipes, bottles, and marbles found in the vicinity. The value of these long barrows was already known to local antiquarians in the eighteenth century, but sadly this did not prevent a small road being constructed through the middle of the Addington Long Barrow at some point in the nineteenth century. This road still operates today, and allows for good views of the bisected barrow. However, Chesnuts Long Barrow can only be visited via prior arrangement with the land owner, who requests a small fee. Crossing over to the eastern side of the river, the visitor can find three more of the Medway Megaliths in fairly close proximity to one another. By far the most impressive of these is Kit’s Coty House, which is situated at a high point in the landscape and offers impressive views of the Medway Valley. Although the tumulus itself has long since been ploughed away, the entrance to the chamber has been left and represents one of the most striking and iconic dolmens that can be visited in England. Travelling down the hill, the visitor can find Little Kit’s Coty House. Sadly, the stones here are in a jumbled pile and convey little idea of the long barrow’s original design. This appearance nevertheless reminds the visitor of a folkloric tale that is attached to the site. According to one version of this story, a baker from nearby Aylesford tried to count the number of stones by placing a loaf of bread on each. He was unable to complete his task when one of the loaves disappeared and the Devil appeared in its place! Folklorists recognise this as a variant of the wider ‘countless stones’ motif that has been attached to various prehistoric monuments in southern Britain since at least the late sixteenth century. About 400 metres to the north-west of Little Kits Coty House is the Coffin Stone, a rectangular sarsen slab under which were found two human skulls in 1836. It is likely that this too represents the site of an Early Neolithic chambered long barrow. Unfortunately for the visitor, the field in which the Stone is situated is now a vineyard and access is restricted. There is no designated car park for these sites, although parking is available in a lay-by off of Rochester Road. From there the visitor can walk to either Kit’s Coty or Little Kit’s Coty, however they should be warned that there is no footpath along this road, which is often busy with traffic. Time is rarely kind to the relics of prehistory. As we have seen, each of the Medway Megaliths has in its own way been reduced to a picturesque ruin. In at least one case, however, the damage done has been more extreme. In 1823, farm labourers discovered a buried chamber containing human remains. They invited local antiquarian Charles Smythe to examine the site before they hauled the stones away, destroying the monument. Very close to where Smythe’s Megalith once stood can be found a large, solitary megalith known as the White Horse Stone. Although archaeologists cannot yet be sure whether this was ever part of a chambered long barrow or not, it remains a distinct possibility. While the archaeology of this megalith may therefore be unremarkable, it has gained considerable interest through its folkloric associations. In the nineteenth century, it was claimed that the site gained its name after the banner of the white horse – carried by the legendary fifth-century Anglo-Saxon invaders Hengest and Horsa – was found by or beneath the stone following the Battle of Aylesford in 455. The story is unlikely to have any validity as an accurate account of early medieval events, although nevertheless has resulted in the White Horse Stone becoming a sacred place for certain modern Pagan groups which claim a spiritual lineage from the Anglo-Saxons. The site is not well signposted. Visitors arriving by car can follow the A229 in a southbound direction before parking in a slip road next to the Shell petrol garage. 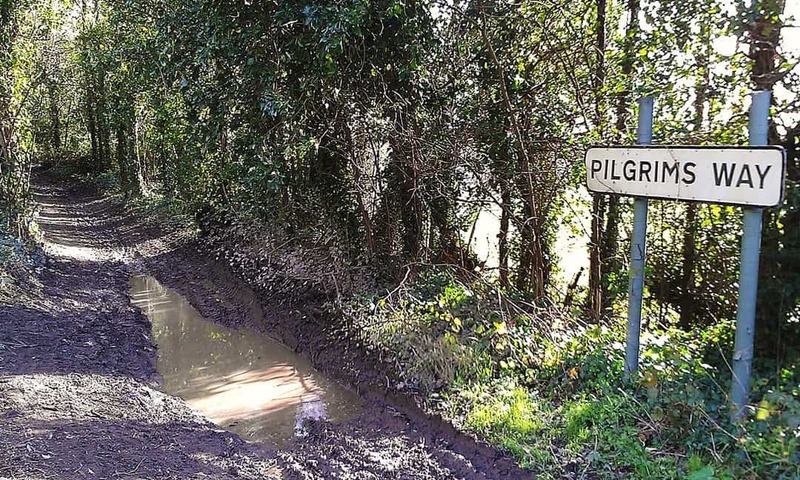 From there they can access the Pilgrim’s Way, the famous prehistoric track that was used by Medieval pilgrims traveling from Winchester to Canterbury. Visitors should proceed along the track for about 100 metres, crossing over the Eurotunnel railway bridge, before they find the White Horse Stone on their left-hand side, within a thin strip of woodland. The Medway Megaliths represent the only prehistoric tradition of megalithic architecture that can today be found in south-eastern England. They are therefore essential visiting for any prehistory fans either living in or visiting the region. Their location in western Kent also means that they can easily be incorporated into a well-organised day-trip from London, for hikers or cyclists. Although transport costs need to be considered, most of the sites are freely accessible and thus ideal for the visitor on a budget. Moreover, the fact that they have not gained a reputation as a tourist hotspot means that the visiting experience can be enjoyed without having to compete with the crowds. The fact that these sites have not been transformed into tourist attractions does however mean that little has been done to promote ease of access. Anyone expecting toilet facilities, a café, and a gift shop will be disappointed. 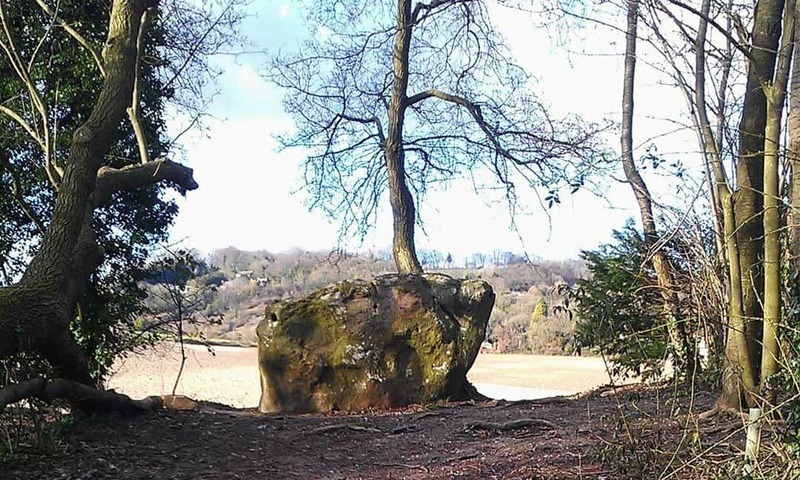 The Coldrum Stones is the only one of the Medway Megaliths with a purpose-built car park and none of the sites are particularly close to a train station (the nearest, recommended station is Aylesford). Many of the monuments are not well signposted (if at all) and thus some preparation is required; snacks, appropriate footwear, and a good map are all strongly recommended. However, those prepared to put in a little time and effort will be richly rewarded with a fascinating exploration of prehistory, folklore, and contemporary Kentish folk custom. I am a postgraduate student at University College London working on a doctoral project examining religious practices involving water-places in early medieval England. My broader research interests focus on the religious beliefs and practices of past societies, as well as the use of archaeological material by contemporary religious groups. Different aspects of this work has been published in various books and scholarly journals. When not out hunting down archaeological monuments in the landscape, I still occasionally blog over at Albion Calling.